The ability to record tests has always been possible with Dynatrace Synthetic, using a separate recording tool available from the portal. Now it’s even easier, with the new Dynatrace Recorder (in beta at this time). Building your tests are as easy as navigating your web site. The new Dynatrace Web Recorder works as a Chrome plug-in, so you open the Dynatrace Portal using Chrome. A key feature of this design is that tests can be recorded on any platform supported by Chrome, including Windows, Mac, and Linux. If you’re not a Windows shop, you don’t have to keep a Windows machine available to record tests. Within the Dynatrace Portal, select Setup Tests | Tests. You should have a list of your existing tests. Choose the Add Test button. Now you have an option to choose your test combinations. 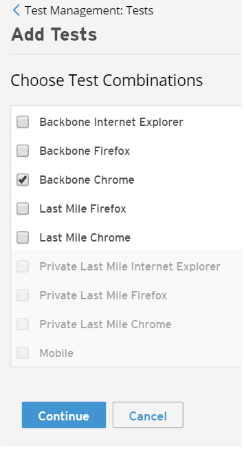 You can choose any type of browser and test combination; the test will play back regardless of whether on Firefox, IE, or Chrome, and whether it is a backbone test or a last mile test. Once you have chosen the test you want to create, click Continue. Now you have the option of entering one or more URLs, choosing an existing script, or recording a transaction, which today indicates that this option is in beta. Select Record a Transaction. The display changes to give you the ability to open the recorder. Select the Open Web Recorder button to continue. You now have to enter a URL for the starting point of your recording. Once you enter a URL, press the Start Recording button. 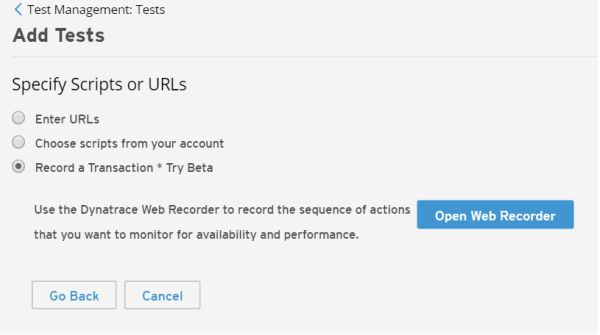 The Dynatrace Web Recorder opens the Chrome browser to the designated URL, letting you click on links, enter data, and navigate the site or sites. When you’re done, either close the session by selecting the Dynatrace logo in the toolbar, or simply close the browser window. Once the session is closed, Chrome will display the screens visited as well as the actions performed at each step. Saving this session puts it in your test list, lets you treat it like any other synthetic test. It is provisioned with pre-selected backbone nodes, or you can select different combinations of backbone nodes and execute the recorded test, set alerts, and enable screen capture on error (SCoE), for example. You can record a test, set up alerts, backbone nodes, last mile configurations, and kick off the test all within the space of a few minutes. No special configuration is necessary, and you don’t have to write and debug scripts. This can save days and even weeks when provisioning and executing tests. Today, the new Dynatrace Web Recorder works as a plug-in to the Chrome browser, and captures backbone and last mile tests. The legacy Dynatrace Recorder also remains available. It is a rich client application installed on a Windows system, and also has no limitations on the type of test that you’re able to record. By starting to use the new recorder now, you can start saving time creating and maintaining tests, and even come up with new tests that you didn’t have time to devise in the past. Further, you can record tests on any operating system running the Chrome browser. Try it out, and good testing! Peter Varhol is community evangelist and a product manager for Dynatrace Synthetic Monitoring. He has been an evangelist, product manager, technology journalist, and university professor in his career, and speaks regularly at industry technical conferences. He has graduate degrees in computer science, applied mathematics, and psychology. You can contact him at peter.varhol@dynatrace.com.